In other words, the control group, the group of normal individuals who did not have depression but were given the antidepressant medications during the trial phase of the drug company’s research, reported they had experienced suicidal thoughts and ideations, and thoughts of violence. 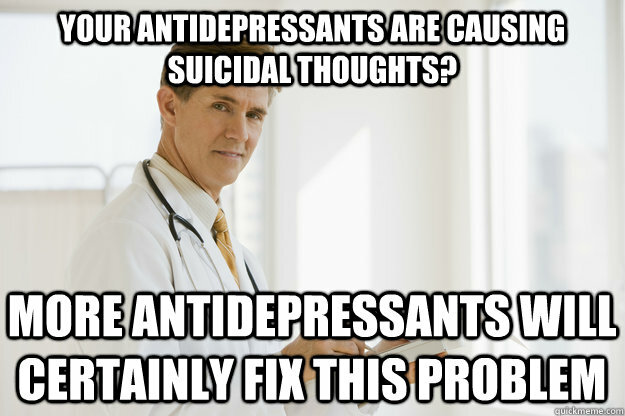 Put bluntly, antidepressants can potentially make a normal person want to kill themselves or others. As reported by The Express, “Experts working on the study said the analysis was undertaken because the harms of antidepressants, including the risk of suicide, are often explained away as if they are disease symptoms or only a problem in children.” The Free Thought Project spoke with an ER nurse to confirm these suspicions and get an opinion from someone working in the field of Emergency Medicine. The nurse, who wishes to remain anonymous, said she’d been working in the emergency room of a hospital on the East Coast for 10 years. She said she’d taken care of nearly 100 patients who’d committed suicide and all but one, by her recollection, were taking antidepressants. And she has seen double that number attempt suicide, most of whom were taking the medicines. Most of the attempted suicides and suicides were done by hanging. But questions remain. After all, if the medicines are working to keep adolescents and adults from killing themselves, wouldn’t the numbers be reversed? Wouldn’t the reports coming from the ER be that children not taking medicines were killing themselves, but medicated children were safer?? She conveyed a conversation she overheard, whereby doctors in the ER were discussing antidepressants being given to children. One ER physician said, “I would never give antidepressants to children,” to which the other doctors agreed, making similar comments. Did you catch that carefully worded phrase? It reads, “suicidal thinking and behavior.” In other words, even the FDA admits children and young adults are killing themselves while taking a medicine that is supposed to keep them from killing themselves. Maybe you or someone you know is already taking the medicine and you’ve been wondering where those suicidal thoughts are coming from. It may be time to check to see if the drug you’re taking is on the list. Here’s the list of drugs which the FDA says must carry the suicide warning label. Their website offers a list of alternatives to psychotropic drugs and a word of advice to persons seeking help from a psychiatrist. If a psychiatrist diagnoses you with a psychiatric condition, ask them to perform a blood test or a brain scan to confirm their diagnosis. They cannot, because there aren’t any blood tests or scans which can be performed for any psychiatric diagnosis, according to CCHR. And therein lies the problem. CCHR suggests because the general public has been conditioned to trust their physicians without question, leaving patients at the mercy of the diagnosis and the drugs prescribed, which might just be a deadly combination.